Hello Mood Sewing Network! Long time, no see! I took a couple months away from sewing and blogging this spring in order to take care of a few “life” things, and, if I’m being completely honest, to recharge my sewing batteries. But now… I’m baaaaack! And apparently I need to brush up on my blog photo skills, because I left my camera bag in all these photos! Whoops! 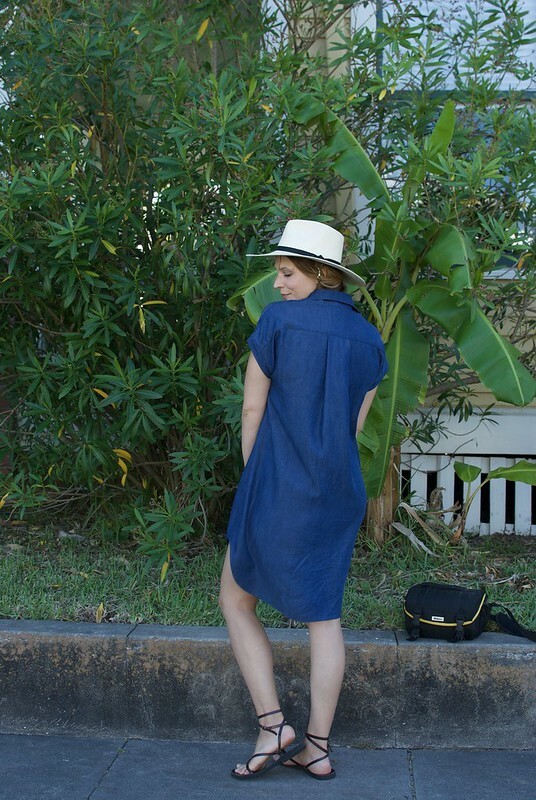 Many moons ago, I pinned a photo of a woman wearing an oversized denim shirtdress that I found on the internet to my inspiration folder on my desktop. The woman looked so chic. Perfectly casual, and relaxed, yet somehow totally pulled together. 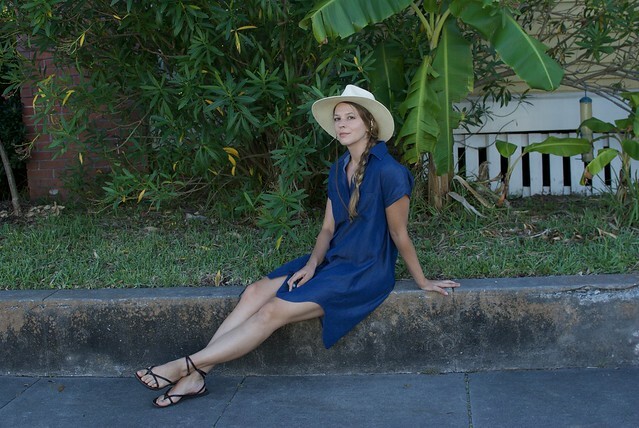 When Closet Case Patterns released their Kalle Shirtdress pattern earlier this spring I knew exactly what I wanted to make with it, and it just so happened that Mood Fabrics had exactly the perfect fabric to make my inspiration dress come to life! 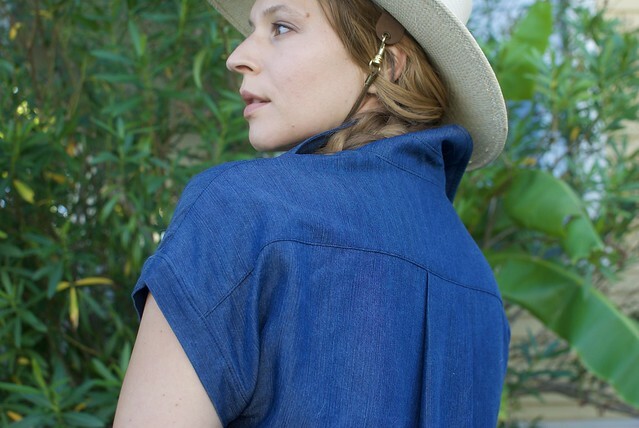 This Blue Textured Tencel Denim is, sadly no longer available (I had been hoarding it for quite some time) but Mood does have a really nice selection of tencel denim available on their website. 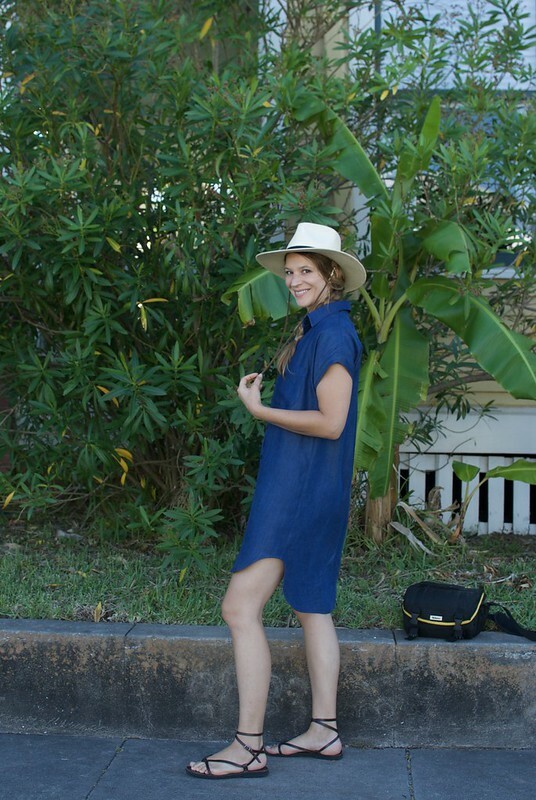 A tencel denim is really perfect for this dress, because it adds a really nice drape to the oversized shape. I love the nice blue indigo color, and the medium/light weight of this fabric keeps things opaque and gives the garment a weighty hand. 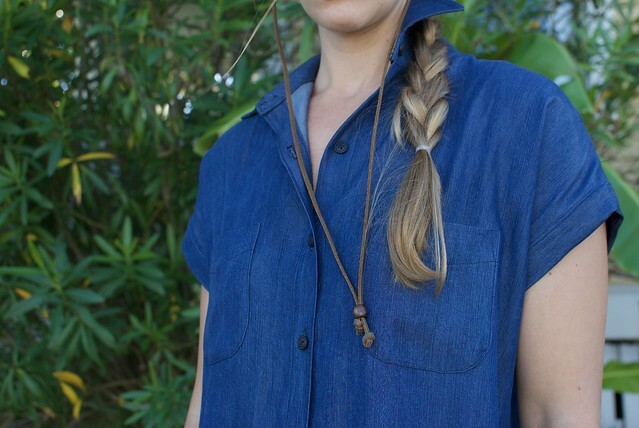 It also has a lovely subtle sheen which elevates the look from your standard cotton chambray. Working with this fabric was pretty straightforward. It did fray pretty easily, but the majority of the seams are concealed during construction, so I just had to use my overlocker to finish the side seams. It pressed well – perhaps not as sharp as a pure cotton or linen or silk – but definitely better than most polyester’s I’ve worked with. I did all my topstitching in a dark navy thread to keep the overall look subtle. 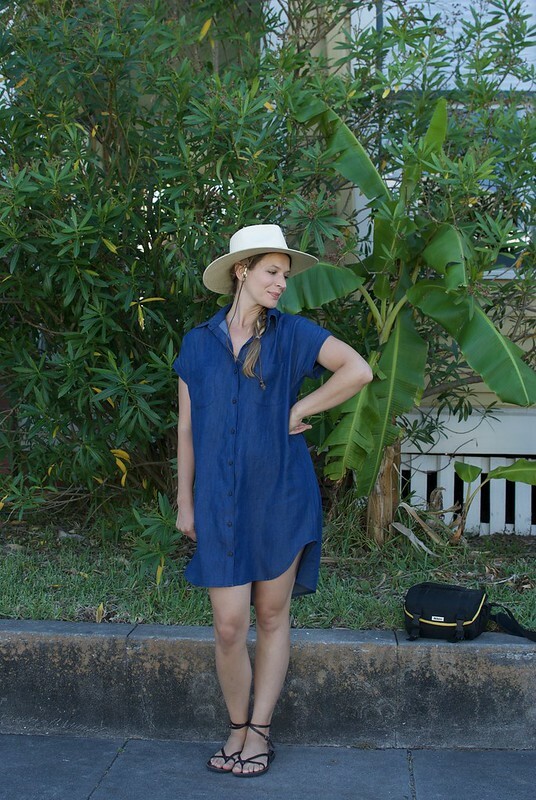 The Kalle shirtdress pattern was a great one to come back to after a sewing break. It had a lot of fun shirt-making techniques – like the collar stand and collar, the curved pockets, and that lovely exaggerated curved hem – but it stopped short of sleeves, cuffs and plackets. The oversized, drop-shoulder shape also made fitting pretty much a non-issue. So it was challenging enough to keep my interest, but easy enough that I could bang it out in two sewing sessions over the weekend. 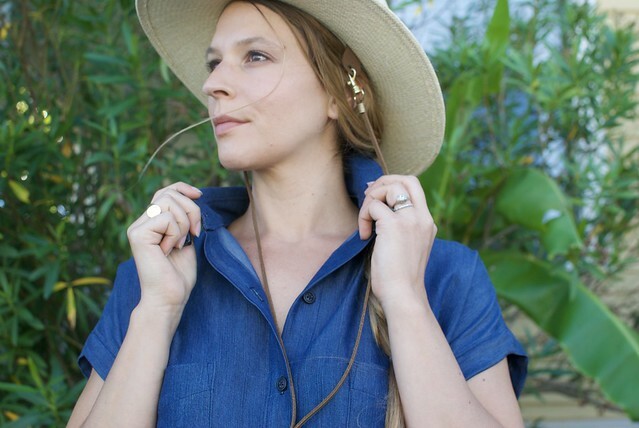 Style wise, the drop-shoulder, sleeve cuff, and deep box pleat are some of my favorite features. 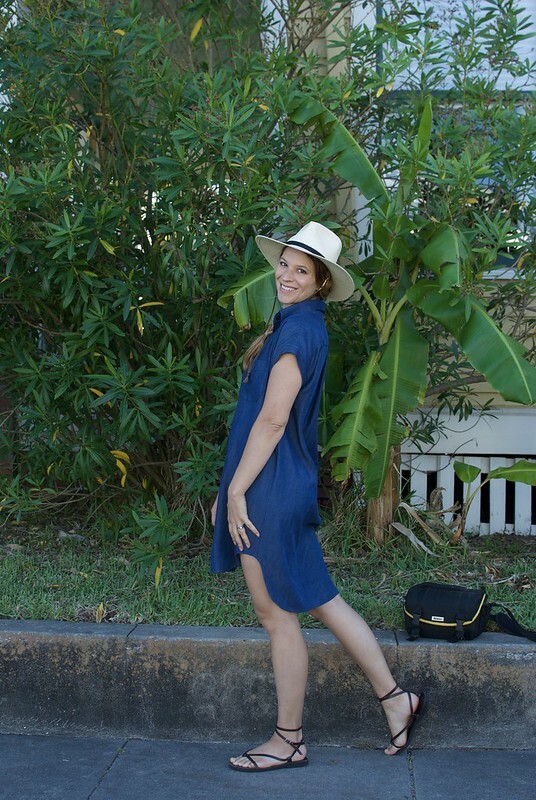 I think this dress is so modern, yet classic, and incredibly wearable! The combination of fabric and pattern totally helped create my own version of my longtime inspiration dress, and wearing this today left me feeling excited about fashion and style again. I can’t wait to get back in my sewing room and share more things with you guys! It’s good to be back!